It took hours before they could finally see the hole at the center of the controversy. It took a little longer than expected, but by all accounts, Tuesday’s spacewalk was a success. 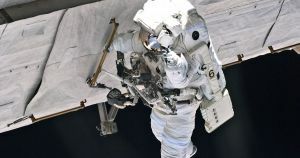 According to a report by the Associated Press, Kononenko and Sergei spent the first four hours of their ISS spacewalk simply making their way to the site of the hole, covering a distance of approximately 30 meters (100 feet).